Heat resistant gloves are required when working around hot glass kilns, it is necessary to wear heat protective gloves when opening and closing kilns as the handles can become very hot. Care should always be exercised when operating a glass kiln and handling hot materials. General purpose heat gloves rated at 400 degrees F (260 degrees C) are fine for opening and closing kilns but are not suitable for the handling of hot materials such as molds or fused glass. Welder's gloves available from welder supply stores can be used for opening and closing kilns but should not be used for handling hot fusing glass. High temperature work needs hot work gloves of a much higher rating. Gloves rated at 800° degrees F (430 degrees C) are good for glass working and using tongs inside a table top kiln to bend fused glass bracelets or for glass raking. 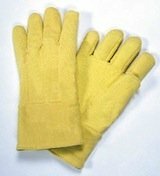 Wool lined Kevlar heat protective gloves are far better suited to this type of work and offer greater protection, these do not retain heat as the lower rated gloves do. They come in different lengths and offer good arm protection. Some gloves incorporating Zetex are rated up to 2000 degrees F (1095 degrees C) for very high temperature work. They are generally thick and cumbersome and not suited for normal fused art glass work. Holding hot material in a glove for too long will result in the heat penetrating the glove. The rated temperature of the glove is the temperature at which the glove fibers absorb heat and start to break down. High temperature protective mitts are available that slip over the fingers and palm of hot work gloves. Mitts will prolong the working life of gloves and are cheaper to replace than a set of gloves.